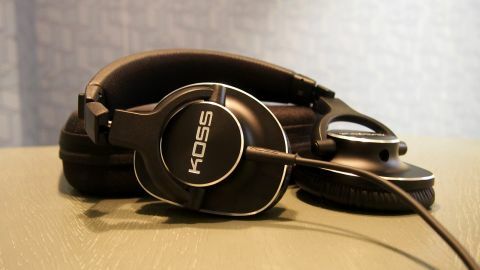 It's hard to to beat the Koss Pro4S when it comes to sheer affordability in the over-ear studio headphones market, but is it the best choice for everyone? Nope. In fact, only lovers of certain genres need apply. Studio headphones are built to serve a unique purpose: to provide unadulterated reference audio of the highest quality. As such, it's easy to find yourself in enthusiast territory, where there's no limit to the amount of cash you can drop on this type of headphone. With plenty of options for studio musicians, technicians or music lovers alike that are marked above $500, what there aren't enough of are cheap options. The Koss Pro4S hope to reign supreme in the low-end of the price spectrum for studio headphones at $149 (about £131, AU$191). For UK and Australia readers, Koss ships globally, so your final price tag may vary with shipping charges tacked on. That is, of course, all the while still hitting the sweet spot of sound quality that audio gurus desire from this style of over-ear cans. These cans have the potential to be an attractive option for those looking to make a budget-minded leap. But are the affordable Pro4S worth checking out for those who are simply looking for a good set of headphones? The Pro4S aren't the hulking monstrosities seen around the over-ear studio headphone scene. Rather, they're a delightfully lightweight exception. Taking a tour around the model, the headband is upholstered in leather and mesh padding. The adjustable metal band can accommodate a wide range of head sizes. I'm of the belief that if the Pro4S can fit my head, it can fit yours too. Stretching down from the sidearms, the aluminum earcups are attached with strong, metal hinges. Being lightweight is one of the Pro4S' best qualities, flexibility is another. These hinges allow the earcups to conveniently fold up into the headband to be stowed away in a large coat pocket. For an extra bit of flex, the earcups can swivel 180 degrees. Rest them open-faced around your neck in between jam sessions, if you please. These aluminum earcups on the Pro4S follow Koss' own clever "D-profile" design. It's not rocket science, the shape of these cups literally looks like the letter "D". This shape just so happens to sit perfectly around the ear. This translates to long-lasting comfort and better sound reproduction thanks to a natural-fitting seal around the ear. Thank goodness the "X-profile" never caught on. The Pro4S includes a coiled cord that can be attached to either earcup. Whichever 3.5mm port you aren't using can be daisy chained to other headphones for the silent rave of your dreams. As studio headphones, the Koss Pro4S strive to play your music naturally without bias. They succeed in that effort, certain production styles and genres sound great. Unfortunately, a bit of a double-edged situation arises, as other genres fall flat on their face. The best way to illustrate this strange effect is with jazz. Chick Corea's "Captain Marvel", for example, is multi-layered with vocal and instrumental tracks. This production style highlights each instrument in the recording equally, and this is the type of presentation the Koss Pro4S reproduces best. This is all peachy if you're a fan of jazz or other genres of music that are produced meticulously. It's no so great, however, if you don't like jazz or other genres with a pronounced style of production. The chaotic rock of "Romantic Rights" from Death From Above 1979 and the lo-fi charm from "Soma" by The Strokes come through, but not as brilliantly. It's hard to fault the headphones when they were made this way by design, but when the headphones only flex their stuff for a particular crowd, it becomes a problem for those left behind based on their taste in music. Finally, the "D-profile" sounds like marketing fluff, but the design does offer more comfort than the typical circular cup does. This design works as a catch-all to fit comfortably on most ear sizes. And no complaints for the headband, either: its padding provides comfort through long sessions. The design of the Koss Pro4S forges its own path, avoiding the overbearing size of most studio headphones, instead sticking to a smaller size that's portable. The "D-profile" of the cups are a thoughtful tweak to the standard formula of circular earcups that boosts comfort. The Pro4S possess the unique ability of providing reference audio without bias and at best, your music will sound great. However, the strength of the sound performance relies completely on the quality of the recording. While jazz and hip-hop sounded great, indie rock and pop sounded shockingly pale. And while I liked the coiled cable at first, it quickly became an annoyance. The struggle of keeping it out of my way while typing at the desk always ended in bitter defeat. Casual listeners should look elsewhere for a set of headphones that are more at the ready to play a wide variety of music genres favorably. The Koss Pro4S, while inexpensive, don't deliver the evenly-spread listening experience that folks with a diverse catalog of music might desire. However, an affordable option for studio headphones is always welcome. For studio-dwellers, the Koss Pro4S isn't just affordable, it's comfortable and - at its best - a solid performer. If you know what you're in for, you'll find a lot to like here for a good price.